Is OPEC even that powerful anymore? Is OPEC now in the least powerful position it has ever been? On the back of a recent rally in crude oil prices which has seen the price of West Texas Intermediate hit $50/bbl, overnight, somewhat unsurprisingly, OPEC elected to do nothing. OPEC meets periodically to set production quotas to allocate exactly how much crude oil to put onto the market. As an organisation, it controls about 39 million barrels of oil per day according to the US Energy Information Agency – while non-OPEC production is about 57 million barrels. Suffice to say, the fate of 40 million barrels of oil per day has the potential to shock the market and OPEC has been wielding its influence for some time. There was a collapse in the price of oil back in November 2014, sending the price of crude down from above $100 per barrel to approximately $30/bbl. It was driven by an oversupply generated by the US pumping crude out of shale formations, meaning it was buying less on the international market. OPEC didn’t adjust its production position, and therefore the price of oil collapsed. The theory went that OPEC, threatened by the emerging status of US crude producers, conspired to drive down the price of crude to send US drillers out of business altogether. After all, the price of pumping crude from Saudi Arabia is much lower than producing oil in the US – where costly hydraulic fracturing becomes involved. To this point, the market had been crying out for OPEC to cut its production to create a supply imbalance. Even OPEC nations such as Venezuela had been calling for OPEC to at least freeze production. OPEC, though has really sat on the sidelines and waited to see how things panned out. As it turns out, the price of crude has been moving steadily upward, gradually. Not enough to create a shock on the demand side, but just enough to have the members of OPEC breathing a little bit easier. In recent times the question has been raised whether OPEC can intervene in the market the way it once could. There’s an ever louder line of thought that there would be a great amount of discord among members if OPEC decided to cut or freeze production. Aside from smaller members such as Venezuela whose economy is geared towards oil production, one big player in the organisation has a pretty good reason to keep on pumping – Iran. Back in January, Iran found itself free to resume oil and gas sales on the open market – there had been rumblings that Iran had found a way to do so anyhow mostly through gold swaps with India and Turkey. The lifting of US sanctions on the nation, however, gives Iran an opportunity to spread its crude to other markets – and it is more than likely to be exploring that option. It has jet planes to pay for, after all. Iran isn’t exactly Saudi Arabia, but it still produces around 3 million barrels of oil per day – about a tenth of the organisation’s production. Some think the real figure is about twice that. You can imagine that may start to go up, too, as Iran explores new opportunities for commerce post-sanctions. It’s also a pretty heavy political player in the Middle East, where a total of 25 million barrels of oil per day of production comes from. 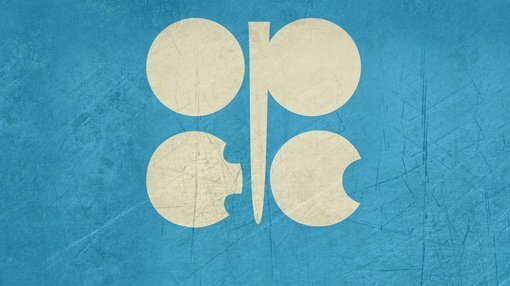 Remember, OPEC produces 39 million barrels of oil equivalent – of which 32 million barrels are crude oil. So the Middle East region controls roughly 78% of the organisation’s production and Iran is a major political player in it. In light of that, the continued inaction of OPEC is perhaps understandable – but questions have now begun to be raised about whether it can even intervene in the market. Can OPEC still shock the market? Let’s say theoretically the price of oil climbs too high for OPEC’s liking – to what extent can it start pumping crude like there’s no tomorrow. Well, according to the IEA, the organisation’s ability to do just that is at its lowest since 2008. 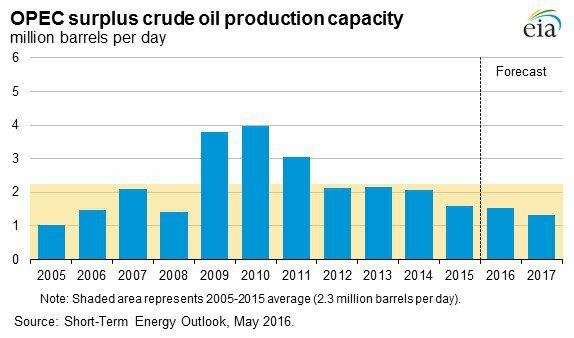 Below is a chart of OPEC’s ‘spare capacity’ – meaning the amount of oil it can start flogging onto world markets at a whim. Surplus is at its lowest ebb since 2008 and its forecast to get even lower. Undoubtedly the addition of 1.5 million barrels of oil per day would be somewhat of a shock to the market – but 1.5mmbpd is less of a shock then, say, 4mmbpd – as it was back in 2010. So if the price goes high, how much crude could OPEC get onto the market and how quickly could it do it? That’s a key question the organisation is facing, as is its ability to secure a production freeze from its members. So – does the inaction stem from deliberate strategy or are there complicating factors at play here limiting its ability to act in either direction?